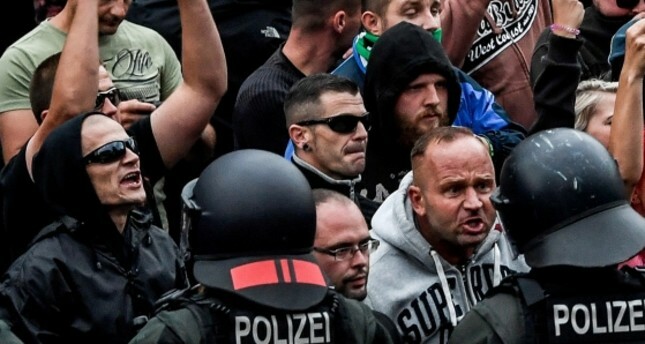 The far-right Alternative for Germany (AfD) party and the anti-Islam Pegida movement have announced a joint rally to protest crimes perpetrated by migrants after two similar protests turned violent on Sunday and Monday. The rally will take place on Saturday at 5 pm (1500 GMT) in the eastern German city of Chemnitz, where the death of a German man - allegedly at the hands of a Syrian and an Iraqi - sparked clashes between rival protesters and random attacks on foreigners. The AfD's chapter in Saxony, the state where the violence took place, said the Saturday rally would allow people to "jointly mourn Daniel H and all of the victims of forced multiculturalism," using a shortened version of the victim's name in line with German privacy laws. AfD leader Joerg Meuthen earlier told public broadcaster SWR his party was "not fanning the flames - there is a dark mood in the country which is only too justified." A spontaneous protest in response to the death drew 6,000 anti-immigrant protesters and 1,000 counter protesters on Monday. It resulted in clashes in which 20 people, including two police officers, were injured. There were no mass street protests on Tuesday evening. The AfD was founded in 2013 and first gained seats in Germany's national parliament after elections last year. Pegida, or Patriotic Europeans Against the Islamization of the West, was founded around the same time and gained traction during the refugee crisis.